Nonpayment of rent is obviously one of the biggest problems facing landlords. It always was and probably will continue to be. But for now, we can take steps to minimize losses when rent isn't paid. Nonpayment of rent doesn't always mean the rent was not paid. A partial rent payment creates an unpaid portion. In many leases, including The LPA Lease, past due charges such as unpaid late fees are deemed payable as "added rent". Unpaid Added Rent is the same as unpaid Rent, valid grounds for eviction. If you need to collect unpaid rent, there is a legal process that must be followed. When rent is not paid on time, the landlord should be prepared to take action like an automated robot, to collect before too much time passes. Don't be strung along by the tenant waiting for some windfall that may never come. The Urgent Late Notice includes many features: Late Rent Notice - Be prompt in issuing your tenant a late notice when the rent is not paid by the end of the rent grace period. (That is the date rent becomes late - in my lease it is after the 5th day after due date). I always recommend using a late notice that informs the tenant of late fees. (As long as your lease provides for late fees) I also think it's a good idea to let the tenant know that you or your management company operate on a schedule and the clock is always ticking each month. Eviction Notice / Attorneys Letter - I prefer to send an attorney's warning letter (optional) instructing the tenant to pay all rent and late fees before actually commencing eviction in court. (Ask your attorney to prepare a warning letter for pre-eviction situations.) I send it along with a Notice to Pay Rent or Quit, Demand for Payment. 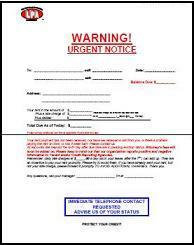 I also warn the tenants in the notice that we are about to make a negative impact on their credit record. Eviction Process - If the cure time in your eviction notice expires and the tenant has not paid, you must be ready to go forward with a court eviction. If you are unfamiliar with the process of evicting a tenant, I highly recommend you use a lawyer who is experienced in landlord tenant eviction cases. Unless you are an attorney or an expert at landlord tenant law, it is not a good idea to do it yourself the first time. Credit Bureau Reporting - If the tenant owes me money, whether we've gone to court or not, I have the ability to report a Bad Debt* onto the tenant's credit record which will stay there for 7 years. * The LPA offers the ability for landlords to report delinquent rent onto the tenant's credit report. When the tenant doesn't pay the rent, it is a serious matter not to be ignored. Many of us prefer to give the tenant another day and keep hoping that nothing is wrong because we don't want to believe anything is wrong. Just remember that the longer we give the tenant before trying to collect, the easier and more comfortable we make it for them to steal from us.